RED FRIDAY is a military campaign that allows people to show their support for all of our military service members who are serving or deployed. RED stands for Remember Everyone Deployed. 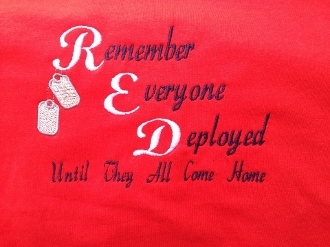 Wear your RED on Fridays until all our military members come home. This design is embroidered and approximately 3" x 7" to 5" x 7". You choose the embroidered design that you prefer for your RED shirt. All of these designs are embroidered, not screen printed so these high quality shirts are made to last. Be sure to add the name/title if you order the In Support of Our Troops Design. Examples woule be: Mom, Dad, Sister, Nana, Wife, Aunt, Cousin, etc. Please contact us if you have any questions at all. These shirts are co-ed sized to fit both men and women so please keep that in mind when choosing the best size for you.